The Village of East Hampton is a village in the town of East Hampton, New York, United States. It is located in Suffolk County, on the South Fork of eastern Long Island. The population was 1,083 at the time of the 2010 census, 251 less than in the year 2000. It is the center of the summer resort and upscale locality at the East End of Long Island known as The Hamptons. Founded in 1648 by Puritan farmers who worshiped as Presbyterians, the village of Easthampton was a farming community with some fishing and whaling. Whales that washed up on the beach were butchered and whales were hunted offshore with rowboats sometimes manned by Montauk Indians. Due to no good harbor in East Hampton; however, it was Sag Harbor which became a whaling center which sent ships to the Pacific. The land had been purchased in 1648 by the governors of Connecticut Colony and New Haven Colony from the Montauk Indians, in large part for small drills to make wampum, their traditional industry; hunting and fishing rights were retained. It was then sold for about £30 to settlers, some from Lynn and Salem, Massachusetts, who had not found room for their herds in Massachusetts Bay Colony. The original name for the village was Maidstone, from a village in Kent some of the settlers may have come from. Each original settler was allotted a village lot of several acres and rights in common to surrounding lands which were regulated by the town government. The area was transferred to the jurisdiction of New York in 1664. In large part early settlers in East Hampton were unacquainted with one another. A great deal of jockeying for position resulted which took the form of legal proceedings conducted by the town government. Summaries of these proceedings were recorded by the town clerk and form the major resource for historians studying East Hampton during the 17th Century; there are few other written records such as diaries. In the late 19th century, after extension of the railway to Bridgehampton in 1870 by predecessors of the Long Island Rail Road, visitors began to summer, at first in boarding houses on Main Street, then in "cottages," which sometimes were substantial estates, built on former farms and pastures in the village. Shingle style architecture was popular from the 1880s. By the early 1890s the prices being commanded for cottage sites, as high as $10 thousand an acre, were the object of comment by the editors of The New York Times. The Montauk Branch of the railroad was extended through East Hampton to Montauk in 1895. It was during the 1910s and 20s that most luxury estates were built by the very wealthy, mostly in the Eastern Plain, a previously undeveloped agricultural area. The privately circulated Blue Book of the Hamptons informed, and continues to inform, fashionable residents as to who is who. The Great Depression and World War II resulted in a lull, but full-scale building of cottages resumed in the 1950s and some of the large estates began to be broken up. By 1968 the exclusive character of the "Summer Colony" had become so diluted by the merely rich that the column of that name in The East Hampton Star was discontinued. The quaint windmills and other sights were favored by artists and art students from the 1890s. It became an artists' colony in the mid-20th century, popularized by the Abstract Expressionists. 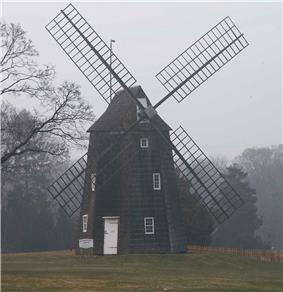 History and surviving historic sites are detailed in "Village of East Hampton Multiple Area", a New York State study. Parking access to the Atlantic Ocean beaches within the village of East Hampton is severely restricted from May 1 to September 30. In 2006 there were only 2,600 permits available for non-residents with a charge of $250. Residents can always get parking permits. East Hampton's beaches are highly regarded because of their clean white sands, the fact they're relatively accessible and because there is minimal development along the beach, which is strictly residential. Parking space at the village beaches is limited, which prevents crowding. Parking is prohibited on neighboring streets. There is no law that restricts people from accessing the beaches via bike, foot or being dropped off. Georgica - This beach adjoining surfers because of currents around its controversial groynes. The beach has bathroom facilities. Main Beach - The beach is the only one with a pavilion where one can get food; it also has a limited number of lockers available to residents. Wiborg Beach - Has a parking lot, and is right next to Maidstone Club. It does not have a lifeguard. In the summer of 2006 it played host to the "hot" surf spot to be at. Egypt Lane Beach - This beach is sometimes incorrectly called Maidstone Beach because of its close proximity to the headquarters of the Maidstone Golf Club. The true Maidstone Beach is on the bay outside the village in the town of East Hampton. Main, Wiborg and Egypt Lane are immediately next to the Maidstone Golf Club. Two Mile Hollow - This beach has the second-largest parking lot of the village beaches. It is, historically, the gay beach of East Hampton. ^ a b "Village of East Hampton". ^ "East Hampton village, Suffolk County, New York". Profile of General Population and Housing Characteristics: 2010 Demographic Profile Data. ^ "Post Offices By County: Suffolk County, New York". ^ "2010 Census: Population Drops in East Hampton Village, Montauk". East Hampton Patch. March 28, 2011. Retrieved June 25, 2011. ^ a b c Bob Hefner. "The History of East Hampton" (PDF). easthamptonvillage.org. Retrieved August 8, 2015. The small groupings of summer cottages that developed from the 1880s to the 1910s in Montauk, Amagansett and Wainscott paralleled the growth of the much larger summer colony in the Inc. Village of East Hampton. ^ a b John Hanc (October 25, 2012). "Before Salem, There Was the Not-So-Wicked Witch of the Hamptons". Smithsonian Magazine. Retrieved August 15, 2015. Elizabeth Garlick, a local resident who often quarreled with neighbors. ^ "Where to Go A-Summering". The New York Times. July 2, 1859. Retrieved August 9, 2015. In any of the Hamptons…there is board to be found among farmers, out of the reach of snobs…. ^ "SUMMER RETREATS. ; Resorts Along the Shores of Long Island and the Sound. Attractions of the South Side and the Northern Shore--Fishing. Bathing and Other Recreations--Hotels, Boarding-Houses and Railroad Facilities.". The New York Times. May 29, 1870. Retrieved August 9, 2015. East Hampton…is the most attractive of all these places…. ^ a b "Art and Windmills". The New York Times. July 24, 1892. Retrieved August 9, 2015. …five or ten thousand dollars an acre for modern cottage sites. ^ a b "Village of East Hampton Multiple Resource Area NY" (PDF). 1988. ^ David E. Rattray (August 8, 2015). "How Many Are Here? No One Knows". The East Hampton Star. Retrieved August 8, 2015. ^ "Geographic Identifiers: 2010 Demographic Profile Data (G001): East Hampton village, New York". U.S. Census Bureau, American Factfinder. Retrieved December 20, 2012. ^ "New York: 2000 Population and Housing Unit Counts" (PDF). September 2003. p. III-15. Retrieved December 22, 2010. ^ Christopher Walsh (June 23, 2015). "East Hampton Village House Size Limits Adopted". The East Hampton Star. Retrieved August 8, 2015. The police department building is part of the Municipal Emergency Building located at One Cedar Street in East Hampton. 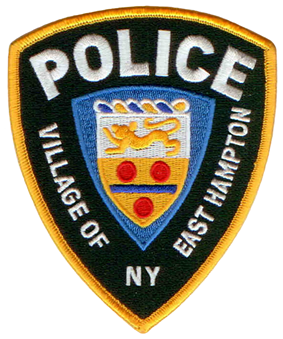 Law enforcement in East Hampton is the responsibility of the East Hampton Village Police Department, chosen in 2009 for New York State accredited status. The department is located within the town of East Hampton, in Suffolk County, New York. It is headed by Chief of Police Gerard Larsen, Jr., and staffed by 22 full-time officers and 13 civilian staff. The department has both a uniformed and detective division. The size of homes that can be built in East Hampton is regulated. The point is to ensure that new construction is more or less compatible with size of the lot it is constructed on and the neighborhood it is located in. The median income for a household in the village was $56,607, and the median income for a family was $62,500. Males had a median income of $41,181 versus $37,083 for females. The per capita income for the village was $51,316. About 5.5% of families and 8.2% of the population were below the poverty line, including 13.2% of those under age 18 and 5.8% of those age 65 or older. In the village the population was spread out with 14.4% under the age of 18, 4.5% from 18 to 24, 22.6% from 25 to 44, 31.3% from 45 to 64, and 27.1% who were 65 years of age or older. The median age was 52 years. For every 100 females there were 95.9 males. For every 100 females age 18 and over, there were 92.6 males. There were 635 households out of which 16.9% had children under the age of 18 living with them, 42.2% were married couples living together, 6.9% had a female householder with no husband present, and 46.9% were non-families. 36.4% of all households were made up of individuals and 18.0% had someone living alone who was 65 years of age or older. The average household size was 2.07 and the average family size was 2.68. As of the census of 2000, there were 1,334 people, 635 households, and 337 families residing in the village. The population density was 280.3 people per square mile (108.2/km²). There were 1,745 housing units at an average density of 366.7 per square mile (141.5/km²). The racial makeup of the village was 93.10% White, 1.42% Black or African American, 0.15% Native American, 1.87% Asian, 1.87% from other races, and 1.57% from two or more races. Hispanic or Latino of any race were 8.92% of the population.